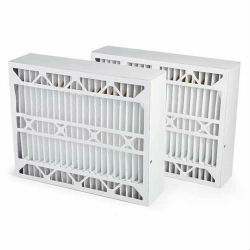 This MERV 16 X6675 filter from Lennox offers a 98% efficiency, capturing particles as small as 0.3 microns. Its larger capacity allows for greater dust-holding ability. 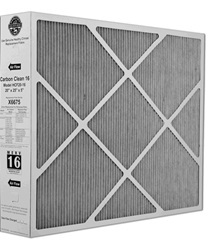 The Lennox X6675 MERV 16 filter is the recommended replacement filter for the Lennox HCC20-28 Air Cleaner and is suitable for many others such as Trion Air Bear, Honeywell and Carrier Air Cleaners that accept a nominal 20 in X 25 in X 5 in filter media. Double-wall beverage board box for rigid construction. This product was added to our catalog on Monday 14 December, 2015.